I don’t think I have ever met someone who doesn’t like pizza, but I have met people who can’t agree on what type of crust to order, or what toppings to put on it. Keto is generally the type of diet that you have to refrain from eating pizza, but that is only in the traditional sense. Here is a keto-friendly recipe that you can indulge on and still stay in ketosis. Just make sure that you don’t sit down and eat the whole thing at once (Though I doubt you could with how dense this pizza is). This dough isn’t made with Cauliflower either, so if you’re tired of that you can rejoice! The dough is based on the popular Fat Head style bread, with some twists in the recipe to make it more flavorful as a pizza crust. This makes the pizza crust on the bottom very flavorful, and incredibly filling at the same time. I am a hungry grown man, and I struggled to eat 3 slices of this pizza for dinner (The whole pizza makes 8 slices). 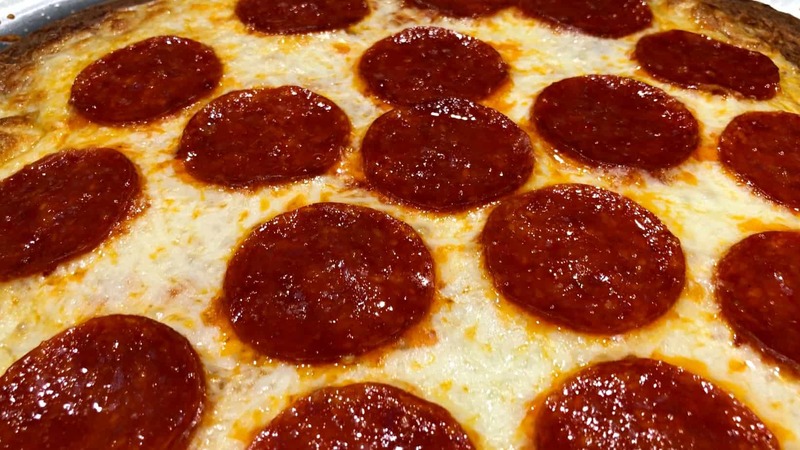 You can put whatever toppings that are keto-friendly on this pizza if you wish, it is obviously not restricted to having to be a pepperoni pizza only. I would be excited to read in the comments what your favorite keto-friendly pizza toppings are so that we can all be inspired to try new things each time we make this pizza at home. Remove from Microwave and stir together. Return to microwave and nuke it again for about 40 more seconds. Remove from Microwave again, and stir one last time. The consistency should start to become VERY sticky, and you should not see much unmelted mozzarella cheese. If there are still some unmelted cheese, return to Microwave as needed. In a smaller bowl to the side mix together the Almond Flour, Baking Powder, Italian Seasoning, Parmesan Romano Cheese, and Eggs. Combine the ingredients from the smaller bowl into the bigger bowl and mix together well. Add the remaining 1 Cup Mozzarella Cheese on top of the mixture and mix well. Set out Plastic Wrap on the counter and dust lightly with Parmesan Romano Cheese (optional). Pour the mixture onto the dusted portion of the plastic wrap in the middle, and wrap in the plastic wrap to form a general Ball shape. Place the dough into the refrigerator for about 20-30 minutes to firm up a little. Remove dough from the refrigerator after the desired time (you can leave it in there longer if you wish to make this ahead of time). Roll out the dough onto a greased 16″ Pan, and/or cover the Pizza Pan with Parchment Paper. Dough should be spread out until about 1/4″ thick all around. Bake in the oven for about 25 minutes or until golden brown all over. Be careful not to burn it! 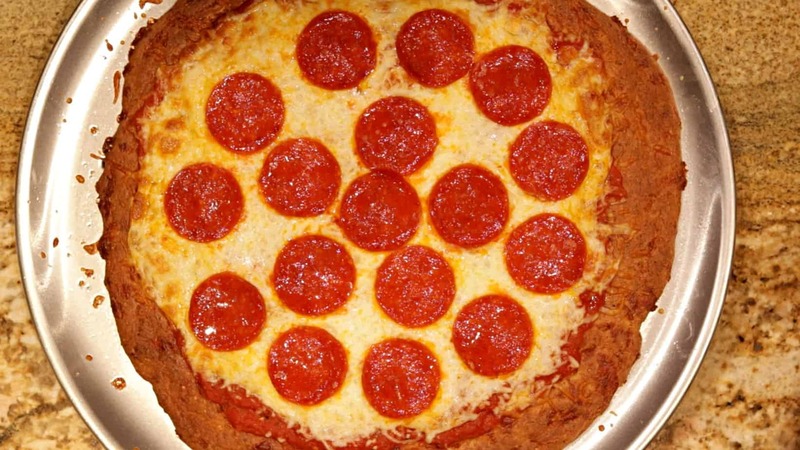 Remove from oven immediately and set on the counter to prepare the pizza toppings. Spread out the 1/2 Cup of Marinara Sauce onto the pizza, leaving the outer 1″ of the crust dry so that you have a dry crust to hold onto later. Sprinkle the Mozzarella Cheese or your preferred Cheese Blend on top of the Marinara Sauce. Bake in the oven at 425*F until the cheese begins to bubble. We have never had leftovers of this in the house, LOL. Not even for breakfast the next morning. This stuff get’s devoured. Maybe someone else has tried freezing before, and can comment. I’ve frozen similar doughs and they are fine. I just pop it in the oven for a few minutes before topping to get it warmed through. Does that also include coconut allergy in your case? Hi! I do not own a microwave. Any ideas how to do this without one? My suggestion would be a double boiler – or simply place your bowl with the cheeses on top of a pan of simmering water and stir until you get the desired consistency. I read on another recipe for a similar dough to just use a non-stick pan and slowly heat it on the stove. Hope that helps! I just made and it in the frig. The dough smells so good. I’ll let you how it tastes. Yep! Just adjust the amounts as necessary for the Almond Flour to Coconut Flour conversion as you will use a 1/3 of the amount. Cool and delicious recipe! A must try! If I make the dough tonight, will it be okay in the fridge over night? I want to make it for dinner tomorrow. Many people have said that works fine. I’ve only made it fresh. But it might even turn out better because then the cheese in the crust will have time to set firmer in the fridge overnight. This looks absolutely amazing! It is in the oven with breakfast toppings right now! You didn’t specify at what temp to bake the dough before adding the toppings. Is it baked at 425° both times? He does say “until the cheese begins to bubble so I’m assuming you have to watch it. AMAZING recipe. I’ve made it twice! One suggestion: there’s NO WAY the crust needs to be baked for 25 min…I’ve always had to take it out after 15 min or so….it would be totally burnt after 25 min! Definitely keep an eye on it in the oven. I have had to bake mine quite a bit longer than that to get it fully cooked. Don’t want all that to go to waste! what if your baking with an electric oven, is the time watch diff. The oven I used is Electric. I made this tonight. It was great. I’ve really been wanting some pizza. The crust came out good but did get a little overdone. I only cooked it for 15 min. Probably could go back to 10 min and watch from there. Added all the goodies: green peppers, onions, pepperoni and hamburger and of course lots of mozzarella. DELISH! That would be a single serving according to the nutrition facts we have listed above. Is the info for a slice including the toppings? There’s a print button at the top and bottom of every page. No print button visible top or bottom of this page. Is the nutrition information just for the crust or the entire recipe as written? I ask because we don’t have that type of pizza sauce where I’m from. The entire recipe with all of the toppings and sauce, per serving of course. So I might be reading this wrong, but can you only have a slice of this? It says the recipe feeds 8. A slice is a serving, meals can be multiple servings. This is amazing! I have made it a couple times now. The second with hamburger, bacon and pepperoni for when I was having a meat lovers pizza craving. I completely feel like I am eating the “Real” thing!! Thinking of trying the crust on a flat pan to use for bread slices. I am so craving a pimento cheese sandwich. Can you save the pre-baked crust and add toppings and bake another day? OH YAY!!! Should I preserve it in the fridge after it’s pre-baked or can I leave it in the pantry in an air tight container?? If im trying to lose weight can i still have this or should i stick to like a cauliflower crust? My husband thinks the crust is too salty. How can I rectify this? Less baking powder. I already cut back the salt. I made this and it sat in the fridge for 2 days before I cooked. Turned out great. Was much easier to roll between two layers of parchment paper cold. I only bake for 10 mins at 400 or it burns. Then I put on toppings and put directly on top of oven rack to crisp up the bottom of the crust. Grandson loved it. This recipe just saved my keto diet! Made a “personal size” pepperoni and mushroom , delicious! And I’ll bet I can play around with the crust and turn it into a decent flatbread, something that so far has been impossible to find.